Experience and veteran leadership was the Sharks strategy on Saturday. It was a winning one, at least for one game. “We’re not that old, right?”, coach Edgren says. Mix experienced veterans like Jonny Edgren and Johan Weidolf with young guns like Shervin Shakki and Josef Hussein and you get what? The Sharks scored a run in the first inning of the first game and legendary pitcher Hiba Nabi kept the Pilots scoreless in the first frame. This looked like one of those close, low scoring affairs that we’ve seen in Malmö the last couple of seasons. Nabi, marked by illness, battled himself more than the Pilots as he let six runs score in the bottom of the second inning to give the Pilots a 6-1 lead. The Sharks came right back to score seven runs in the top of the third, just to have the Pilots add three of their own in the bottom half. After a scoreless fourth, the Sharks scored four in the fifth and one in the sixth to take a 13-12 lead. As Nabi left the mound after two innings, his brother in arms Josef Hussein came in to pick him up. Hussein did just that, pitching well for five innings, giving up six runs (two earned) on five hits, striking out three and walking one. Coach Edgren summarizing game one: “Winning is better than losing”. Hussein provided stability on the mound. On the diamond, coach Edgren and Johan Weidolf combined for outs from third to first like it was 1999. Weidolf also brought with his feared bat with him, going 4-5 on the day. “We got the experience, the other guys got that youthful exuberance and the swag, it’s a good mix”, coach Edgren says. Hussein (1-0) shut down the Pilots in order to earn the win in the seventh as Sharks held on to that 13-12 lead. “We played well, especially offensively, but we got some work to do on defense. Minimizing the errors and making the basic plays”, coach Edgren says. Mokhlad Al-Ghamini started the second game and looked sharp through two innings, striking out the side in the second. The Sharks offensive surge continued as they got to Pilots starter Ryo Ujimoto in the second, scoring three runs for an early lead. Al-Ghamini (1-3) lost his command in the third and fourth inning. The Pilots capitalized on that, scoring three runs in the and four in the fourth to take a commanding 7-3 lead. Rookie Al-Ghamini ended up taking the loss, giving up seven runs (three earned) on four hits and four walks while striking ten. The Sharks then faltered on defense, adding to their error total as ‘Swirvin’ Shervin Shakki took the mound in the fifth. Those errors proved to be decisive as the Pilots added four runs, a lead the Sharks could not counter. “We have to make the basic plays. It’s as simple as that”, Edgren added at the post game press conference. Shakki pitched a scoreless fifth before shaky defense and well placed hits allowed the Pilots to load the bases in the sixth. Coach Edgren inserted himself on the mound but to no avail. The Pilots scored eight runs in that sixth inning to end the game 15-5. 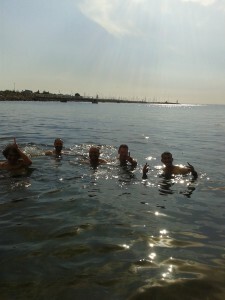 Five sharks in their natural habitat for the traditional post game swim in the ocean. Catcher Toofan Khazal was a difference maker on this day, providing stellar defensive work behind home plate. Niclas Ekström was back at first base. Shockingly, he was not hit by a single pitch on this day either. Joel Earnest was back on the coaching staff for this one and still owns that historically high 50 percent winning average as bench coach. Six brave Sharks swam in the ocean after the game. 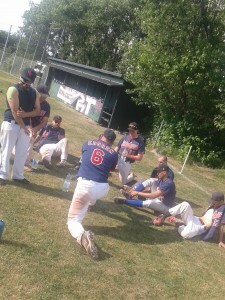 This entry was posted in Baseball, Gothenburg Sharks on June 5, 2016 by alex. Sami Säkkinen won the MVP award of 2012. His strong both offensive and defensive qualities made it a well deserved title that year. He made at least first base over half the times he was facing the pitcher.